"MAKING FIRST-CLASS BESPOKE SUITS FOR CONNOISSEURS IS MY CALLING"
That’s what Max Dietl once said and you can sense his enthusiasm to this day in our workrooms. The 400 m2 light-filled studio of the largest bespoke tailor in Germany is where our 25 seamsters and seamstresses as well as three master tailors exercise their craft. Over 1,000 of the finest materials are on hand for the perfect bespoke suit, including fine pinstripes and chalkstripes, soft tweeds, supple cashmeres and luxurious vicuna. Other high quality fabrics from exclusive designer brands as Loro Piana, Scabal, Dormeuil and Holland & Sherry are also available. The ladies will be delighted by our individual dream creations for that very special occasion. From a gala dinner to the dream wedding, we will be glad to make your evening gown or a one-of-a-kind wedding dress. Browse through our large selection and see for yourself. 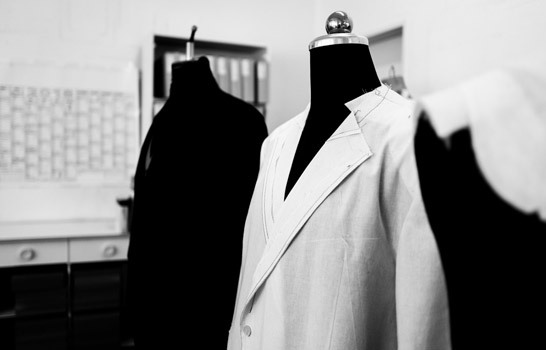 Your fitting is guaranteed to be a truly special experience – after all, your desires are our passion.